If you like deals you will love the Facebook group Darling Deals. The clothes posted are from the boutique Darling and Distressed in Mendenhall MS. You can also follow them on their Main Facebook page and Instagram account. If you join the Facebook Group Darling Deals and sign up for comment/ sold you will get to purchase items for 20% to 40% off retail. So do it now. I am sharing a few things I found in the store and the Deal that is going live today!!! The prices are so good on Darling Deals that it is only good that one day and then the item goes back to its regular price. The deal today is a turquoise t-shirt. Buy it today because tomorrow it will be regular price. I love a great fitting pair of flares and these are super slimming. I have some thick thighs and this style jean is hands down the most flattering on me. 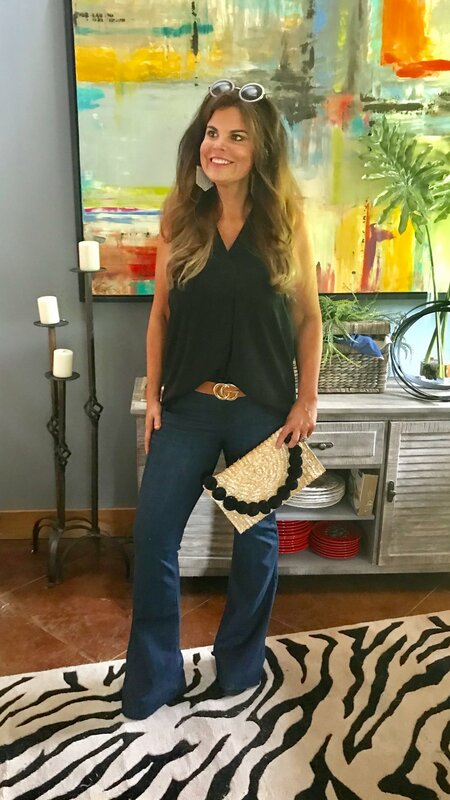 This black shirt is great for date night and I can pair so many fun accessories with it. It is a good staple to add to your wardrobe. The V-neck is very slimming. I have been wanting a black and white striped dress to wear with sneakers and this one is only $28. These sneakers are so darling too. I love a cute look I can throw together with a baseball cap on rainy days or bad hair days. I adore anything boho and this cute dress is perfect. The length is right above the knee. This dress reminds me of Free People at 1/3 of the price. I paired it with a straw hat and these adorable wedges. If you don't live near Mendenhall they are glad to ship. Just message them on Facebook or Instagram or call them.